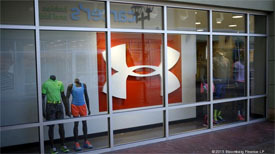 Under Armour is looking to make a statement on Newbury Street in Back Bay with a 30,000 square foot store front. The company is planning to grow its US footprint from 125 to 225 stores within the next year. Under Armour CEO Kevin Plank, speaking at the Boston College Chief Executives Club luncheon at the Mandarin Oriental Hotel, said the company would look at opening a Newbury Street store as well as one at Patriot Place in Foxborough. “The world deserves experiences and it’s our job to give it to them,” said Plank.